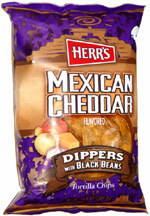 Taste test: With these, Herr's has invented a whole new category of tortilla chip, and the results are amazing. The chips are oval-shaped, very similar to the shape of the extremely popular Tato Skins. They're packed with great cheddar flavor, some very tasty spices, and even a little heat. They're crisp, they're delicious, and they're great. Smell test: Very nice cheesy tortilla chips. Smell. Great.